For most, “quality” is relative. Not so at Leica Geosystems. To ensure our instruments meet the highest precision and quality requirements, we manufacture them in state-of-theart facilities around the world. Swiss technology combines with exceptional craftsmanship to provide best-in-class devices. And this quality also applies to all of our procedures – moving Leica Geosystems towards business excellence to meet our customers’ needs and expectations in every way. The Leica FlexLine TS09plus Manual Total Station is ideal for mid- to high-accuracy applications. The brilliant color display with touch operation, built-in Bluetooth®, USB host and device board offer the highest performance and ease of use. Welcome to the world of Leica Geosystems. Welcome to a world of people, technologies, services and devices that you can completely rely on. Wherever high-distance measurement accuracy is required, you can face the challenge of this demanding task with the TS09plus. It provides the most accurate Electronic Distance Measurement. display. The new Leica FlexField plus software is without a doubt a highlight of the FlexLine plus. Its advantages are immediately apparent with the extra large, built-in color & touch display. The Leica FlexLine TS09plus Communication Side Cover enables cable-free connection to any data collector via Bluetooth®, for example the field-controllers Leica Viva CS10 or Leica Viva CS15 with SmartWorks Viva software. The USB-stick enables the flexible transfer of such data as GSI, DXF, ASCII, LandXML and CSV. FlexField plus Onboard Software: Easy to use due to it's graphical guidance and intuitive workflows. mySecurity gives you total peace of mind. If your instrument is ever stolen, a locking mechanism is available to ensure that the device is disabled and can no longer be used. Whether you want to survey a parcel of land or objects on a construction site, determine measured points on facades or in rooms, gather the coordinates of a bridge or a tunnel – Leica Geosystems’ total stations provide the right solution for every application. They unite reliable results with easy operation and user-friendly applications. 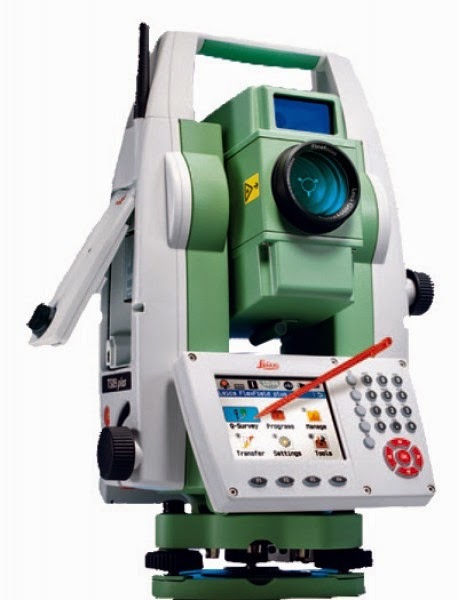 Our total stations are designed to meet your specific requirements. Modern technology enables you to work fast and productively, thanks to the straightforward and clearly structured range of functions. when it has to be right.